Longmeadow, Massachusetts, lies along the east bank of the Connecticut River, just north of the Connecticut state line. The area's rich history predates its 1636 Puritan settlement by tens of thousands of years. Native Americans of the Agawam tribe called the area Masacksic, referring to the long meadows along the Quinneckiot River. 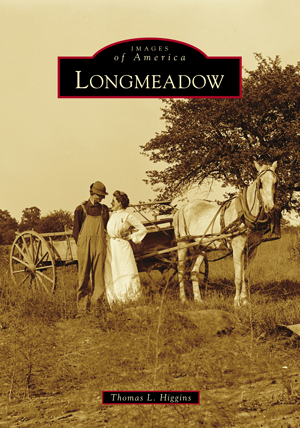 Following the Revolutionary War, Longmeadow became the first town chartered by the Commonwealth of Massachusetts. Notable residents include Steven Williams, the "boy captive of Deerfield," and John "Johnny Appleseed" Chapman. The town's picturesque green is surrounded by historic 18th- and 19th-century homes. As one of Springfield's first "streetcar suburbs," its second wave of growth was landscaped in parklike neighborhoods by the Olmsted Brothers organization. Construction of Interstate 91 fueled a third growth wave, resulting in today's population of nearly 16,000. Thomas L. Higgins is a critical care physician and researcher with prior Images of America books on Baystate Medical Center in Springfield and Baystate Franklin Medical Center in Greenfield, Massachusetts. A Longmeadow resident for over 20 years, Dr. Higgins has published on local and transportation history since high school. Images have been gathered from the Longmeadow Historical Society, including its Emerson Collection online at DigitalCommonwealth.org; area museums; and local residents and organizations.